One of the all time best soundtracks to come out of the vaunted Yash Raj Films production house, Lamhe was also one of the biggest box office flops in Bollywood as well. Whether you enjoyed the story of Viren (Anil Kapoor) who falls in love with Pallavi (Sridevi) while on a trip to Rajasthan or found it quite strange like our friends over at The Post Punk Cinema Club most will agree that the songs from the movie are now considered classics. 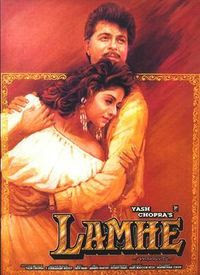 Although it was a commercial disappointment in India, 'Lamhe' became the first movie to make more money in the overseas market rather than at home and is considered a landmark in that regard. It showed distributors in India that there was a huge demand for Bollywood movies with NRI's in the UK and US. Critically speaking it was the most decorated film of the year and swept the Filmfare Awards winning best film, best story, best dialogue, best comedian and best actress. The film was primarily filmed in Rajasthan which is one of my favorite parts of India and quite the tourist mecca for desis and non-desis alike. Indeed, the scenery and music of that region provide much of the unique flavor of the movie and provided many people not raised in India (myself included) our first glimpse into the enchanting state that translates into 'Land of the Kings'. The movie also introduced me to the dusky and haunting voice of Ila Arun who hails from Rajasthan and whose voice provides a striking contrast to that of Lata in both songs for today. While Lata and her progeny ruled Bollywood for good reason, singers like Ila Arun (and for you old schoolers the late great Noorjehan) are what gives Bollywood it's unique tapestry. The songs for today are sung by Lata & Ila Arun - the videos are below and are necessary viewing not just for the glimpse into Rajasthan but also because they showcase Sridevi at her prime. Incidentally, Yash Chopra cites this film and 'Silsila' as his personal favorites - they were both commercial duds but have actually increased in popularity over the years and are now remembered quite fondly.